Beneficial for headaches, stiff shoulder, sagging skin, dementia, rheumatism, sleep disorder, and promote brain rejuvenation. Shirodhara is a form of Ayurvedic therapy. The name comes from the Sanskrit words, “Shiro” = “Head” and “Dhara” = “Flow”. It was invented in Ancient India as the “Truth of Life = the way to live a better life”. Western and Eastern medical science trace their roots to Shirodhara and it is approved by the WHO (World Health Organization) as a preventative care for health. A gentle stream of oil is poured on the forehead, or the third eye chakra. 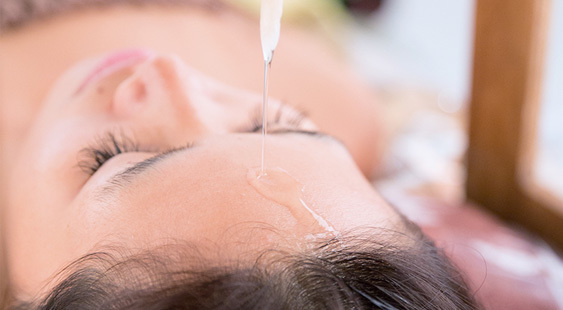 During the treatment, a state of meditation is achieved and the brain becomes relaxed as the whole body is treated with Hawaiian Lomi Lomi massage. You will emerge feeling blissful after a total relaxation of brain and body.